Want to know the latest indicator for a neighborhood's changing demographics? Look no further than the beverage aisle of your local supermarket. When I need to rehydrate, I turn on the tap and drink what has been rated year after year in taste tests, the best city water in the world: New York City water. And it's free too. I have to congratulate the bottled water industry on creating an impressive and successful branding and marketing campaign. Consumers actually have bought into the industry's advertising that bottled water is better, safer and more nutritious to drink than free-flowing tap water. grade containers." This is really important information to have when deciding if you want to fork over at least $2.50 for a less than 8 ounce bottle of water. According to Jared Blumenfeld and Susan Leal of the San Francisco Chronicle we buy bottled water "because we think bottled water is cleaner and somehow better, but that's not true. The federal standards for tap water are higher than those for bottled water" and "it costs 240 to 10,000 times more than tap water." If your wallet is fuller than most during our current financial crises than maybe knowing that "supplying Americans with plastic water bottles for one year consumes more than 47 million gallons of oil, enough to take 100,000 cars off the road and 1 billion pounds of carbon dioxide out of the atmosphere, according to the Container Recycling Institute" will have you refilling your personal water bottle via your home tap. So what does the recent upsurge of merchandising and selling ridiculous variations of bottled water at our local food store have to do with neighborhood demographics? I have used the supermarket as a gauge to how our little area of Queens has change over the eight plus years that my wife and I have lived here: Since 2000 our local Key Food store has changed the types of products it sells to accommodate the change in population and real estate prices. Astoria was once considered the Greece of the USA. Many Greeks immigrated here after WWII, raised families and started businesses. The Irish and Italians followed suit helping to expand and enlarge the Melting Pot. Many of these 'original' immigrant families have aged and moved on and younger, upwardly mobile (myself included) moved to Astoria to escape Manhattan rents. When I first started shopping at Key Food there were a lot of ethnic products on the shelves. From Spetzofai in the deli counter to frozen Calamari. Each year the products changed along with the prices. 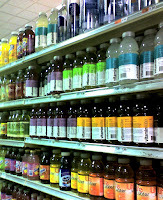 Key Food now has an entire isle devoted to organic products and of course, a lot of different types of bottled water. Along with the alluring colored labels pasted on the bottles comes a 'hipper' and discerning albeit less than thrifty customer. Today, while navigating through the "diary" aisle at Key Food I noticed the overwhelming selection of fruit juices: orange, orange-pineapple, orange-pineapple and strawberry, grapefruit, grapefruit with and without pulp, cranberry, cranberry-pineapple, apple, apple-orange, pomegranate, tomato (nothing seems to partner well with tomatoes) mango, mango-banana, and another stand alone juice, carrot. My God, what happened to eating an orange? This is America and we appreciate free-market and ingenuity and as a recent t.v. ad selling pain relievers said, "we couldn't say it if it wasn't true - because it's on t.v. it has to be true" so if the bottled water industry puts their products on the shelf and adds essential vitamins and minerals to H2O than we must have it. I will continue to monitor the supermarket aisles for signs of increased rents and the changing citizenry. If the selection and price of bottled water continues to be a trustworthy indicator then I will be relocating in the near future.